At last, our dreams have come true! You may recall that the Red Onslaught review bemoaned the fact that we could never seem to get a proper Onslaught toy, but promised that one of the X-Men Legends figures was going to help us out with that (though it turned out to be Kitty, not Rogue). Now that I've finally reviewed the figure in question, my Onslaught can at last be complete! 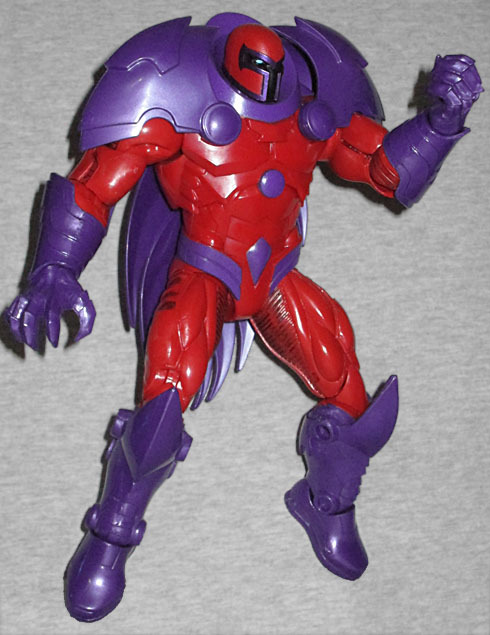 The body, clearly, is going to be the same as Red Onslaught's: a nice sculpt with lots of details that are a mix between what was seen in the comics and the way he was portrayed in Marvel vs. Capcom. Consider this an "ultimate" Onslaught, meant to capture the general feel of the character more than any one specific version. The Magneto head pops right onto the shoulders, completing the look with no trouble. The articulation remains unchanged. As you can see in our second picture, he's completely capable of achieving his idle pose from the videogame, though you'll have to find some flames of your own to put on his hand. The red and purples used on the new head match the rest of the armor perfectly, despite the fact that they came out at opposite ends of the year. The "face" visible through the gap in the helmet is pure black, with no features other than the suggestion of a nose bump (as though he were wearing a cloth mask) and two blank white eyes. I didn't have a problem with Red Onslaught being made as a Build-A-Figure. When he was revealed at San Diego, we specifically said not to worry, because this is Hasbro and they know what they're doing. There are reasons they couldn't just release the Magneto and Red Skull heads together, but they still found a way to give fans what we wanted. I was a little afraid we'd only be able to get Real Onslaught as an SDCC exclusive or something, but nope, it's just a question of finding Shadowcat in the store. It's been a long time coming, but at last we've got the Onslaught we craved. 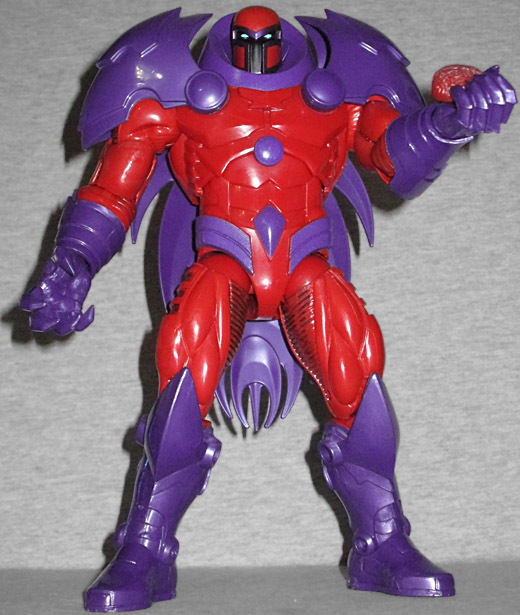 This entry was posted in blog exclusive review, Hasbro, Marvel and tagged Capcom, Captain America, Marvel Legends, X-Men. Bookmark the permalink. Our dreams have come true?